Every day 1.5 billion cups of coffee are drunk somewhere in the world – quite a few of them in this house – but few of us in the North know much about the 25 million families that grow and produce this valuable bean. After reading a new book called Confronting The Coffee Crisis I feel better informed not just about the negative aspects of the story – but also motivated to explore practically the potential of emerging alternative trade networks to change the bigger picture in profound ways. In a system that can involve as many as eight transactions to bring the coffee to market, coffee farmers receive less than two percent of the price of a cup of coffee sold in a coffee bar or roughly six per cent of the value of a standard pack of ground coffee sold in a grocery store. So far, so outrageous. Less well-known are the damaging effects of these unequal power relations embedded in global coffee networks: threatened livelihoods, greater poverty, malnutrition, deforestation, and out-migration. A “bigger, faster, cheaper” mentality has created a dynamic that exploits the most vulnerable at the bottom of the supply chain. The intensification in production that started with the green revolution is based on the use of external inputs like chemical pesticides and ferttilizers, and machines and large scale irrigation to boost production. This technology generates economic concentration, social exclusion, the rtise of expensive ‘patented’ seeds, and the depreciation of natural capital via compacted, eroded and degraded soils, the loss of biodiversity, the pollution of groundwater. Awareness in the North of these problems fuelled the rise of fair trade systems – but their proliferation has now become a problem on its own. It’s easy to be overwhelmed buy a choice of options that can include “organic”, Fair Trade, Rainforest Alliance Certified, Utz certified, shade-grown, Bird Friendly, and so on. Producers have a host of new practical problems to deal with. When Fair Trade adopted a certification-based model, they introduced more coffee-industry actors into what is now a billion dollar global market. At least 200 certifying agencies now audit farmsteads and post-harvest processing, storage, and transport across a global span. Certification has enhanced the livlihood of certified coffee farmers – but the financial and bureaucratic costs are substantial. Certification services are arrayed along a transnational “chain of custody” and documented by an audit trail. Producers feel the effects as they are asked to jump through more and more hoops in order to access high value markets. Although certified markets create consumer awareness of the inequities of coffee production, they often operate within the traditional coffee commodity systems which continue to be controlled mainly by large scale roasters and retailers. The saddest development documented in the book is that Fair Trade is losing its social-movement identity in a bewildering welter of competing labels, brand names, product logos, and other marketing messages. “Direct producer-consumer solidarity ties are giving way to an individualistic consumer politics of choice as the FT labeling system becomes institutionalized,” say the authors. Traditional ‘shade-tree’ coffee systems, with their diverse shade tree species and multiple use strategies, are sophisticated examples of the application of ecological knowledge and can serve as the basis of sustainable agroecosystems of the future. “Next comes choosing the right time for harvesting; harvesting only mature berries; not allowing harvested berries to heat up; sorting berries on intake; making sure the beans don’t crack during the depulping process; double sorting after depulping; making sure fermentation lasts the right length of time, ie between 24 and 48 hours, depending on the altitude and average temperature; thoroughly washing the berries; grading; properly drying, preferably both in the sun, as well as in the drier to avoid mildewing; the drying temperature should be moderate. The temperature should never be turned up to speed the process and save time, since an uneven drying process can significantly damage bean quality. When drying is done on patios, layers should not be too thick and beans should be constantly stirred. Never mix together beans of different grade of quality, beans at different stages of dryness, or beans from different altitudes. Selection, patience and care are the operative words during processing, since all these things make for the best bean quality and, consequently, the best price for the product”. Hmm: so coffee is a complex business. But the book is filled with examples of growers groups that have been able to achieve remarkable progress by pooling expertise and resources that deliver a lot of the value currently added (if at all) by layers of intermediaries. Of particular importance are alternative trade networks and the nascent Community Agroecology Network (CAN). 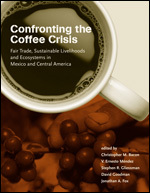 Alternative trade networks emerging in the coffee system are based on lessons learned from farmers’ markets, community-supported agriculture, and attempts in other markets to connect producers and consumers in more direct relationships that are socially just and ecologically restorative, and promote mutual learning and positive change. Alternative trade networks redistribute value through the network against the logic of bulk commodity production, reconvene trust between food producers and consumers during the direct exchange of goods. In Agua Buena, Costa Rica, the farmers’ cooperative has developed the capacity to ship roasted coffee directly to North American consumers’ doors. Coffee delivery depends on the postal service, and direct exchange is difficulty; however email and Internet chatrooms facilitate these interactions. Two other projects also deal with alternative trade networks. The first, Feral Trade, created by the artist Kate Rich, has been trading goods along social networks since 2003; their first transaction was the import of 30kg of coffee direct from El Salvador to a cultural centre in Bristol, UK. The import was negotiated using only social contacts, and was conducted via email, bank transfer and SMS. Then there is the Fair Tracing project whose aim is to to support ethical trade by implementing Tracking and Tracing Technologies in supply chains to provide consumers and producers with enhanced information. The idea is to It will give producers a better overview of the value chain and price structures along it, and to empower consumers to trace a product’s origin and value chain. I’m hoping to involve the Community Agroecology Network (CAN) and Fair Tracing in City Eco Lab, this November, to see what knowledge and expertise might be shared between them and organisations like AMAP in France. Watch this space. This entry was posted in transition & design. Bookmark the permalink. Trackbacks are closed, but you can post a comment.